Maker Bot is a 3-D printing company. They are doing what Apple did in the 1980's. They are taking a idea formerly only done by hobbyists and they are making a finished product for the masses. They have introduced the MakerBot Replicator 2 Desktop 3D Printer which is like the Mac. And the masses will eventually buy once they figure out what to do with them. They will know too. 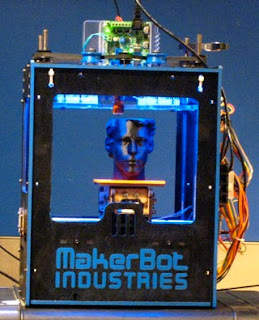 I suspect a huge rise in Etsy, Amazon and Ebay items being sold from these 3D printers. People will build that irreplaceable small plastic part that broke on your dishwasher that some dish washing company will charge you huge amounts for if they even have the part available. The 3D printer movement is upon us. The maker movement is among us. This movement is being touted as the next industrial revolution. It could potentially bring all those products being produced in China back to the countries where they are actually consumed. It will change manufacturing and possibly the jobs that we do in the future. We might be going to a higher movement in the future which could in fact change governments creating a Venus project landscape. Perhaps the only limitations are 1) the ideas needed on what to create 2) the materials needed to create them. The first could be provided with better science, art and medicine education so people could actually have the idea to make a custom built artificial arms like the one used by Luke Skywalker in Star Wars or plastic fish. Without these types of education to help push creativity there is little point in continuing the maker movement. We will not need customized things that interest people but rather just continue to produce mass market junk from a central location as they are now. The second thing that is needed are the materials to create the objects. These could be of anything from thermoplastic, chocolate, biological materials and metal. In order to build layer upon layer these materials have to be in the right form in order to neatly build layer upon layer of your new squishy toy dinosaur or plastic fish. The rheology, viscoscity and surface tension all need to be understood in order to have a printer cartridge that does not get stuck. Different kinds of thermoplastics are being made all the time. Potentially there will be even better in the future for printing faster and more robust items. This is entirely true for the 3D printing technique fused desposition modeling (FDM). Stratasys offers this for building the material out of different kinds of plastic. Currently, the fundamental limit is the viscosity and surface tension of the molten thermoplastic (like the material LEGO is made of ABS(Acrylonitrile butadiene styrene)). One of the best ways to explore this limit would be to use the Kibron EZ-Pi Plus. Then you could make a fish like in the video below out of several different materials depending on if you are in the range. Okay now I am excited! Now I want to go make some stuff...........NEED IDEAS!! !